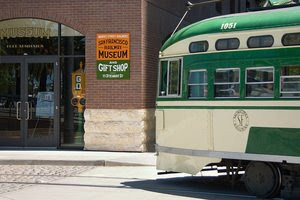 Amanda’s CLOSED 2122 Shattuck Ave./Addison St., downtown, (510) 584-2122. L-D daily; $. No reservations. Step in line here for fast food Berkeley style. Hamburgers are tasty and made with naturally raised beef; a veggie burger is also an option. Fries are a choice of regular or sweet potatoes and are baked; salads are organic and crisp; sodas are house-made and sweetened just right with agave nectar; and cookies are small, but warm and satisfying. The idea is “feel good fast food” that is prepared with little saturated fat and no trans fats. Diners can sit either inside or outside; inside, a communal picnic table made from reclaimed wood is an option. Serving wear is compostable, but of course. In Hilton San Francisco, 333 O’Farrell St./Mason St., 2 blks. from Union Square, (415) 923-4400; /. B-L-D daiily; $$$. Reservations accepted. This inviting, spacious venue features booths and tables, a ceiling with rustic beams made of reclaimed wood, and a signature full-size horse sculpture made with recycled metal. The seasonal menu of organic Mediterranean-inspired fare might include a flavorful braised beef Daube casserole, a perfect portion of hanger steak, or a whole de-boned snapper for two. 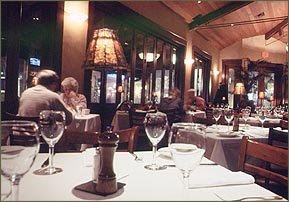 Diners choose from a variety of sauces to flavor the simply grilled items (black pepper and Armagnac pairs nicely with steak), and side dishes include french fries in a cone, smooth garlic mashed potatoes, and perhaps some roasted Brussels sprouts or mushrooms with garlic—all served attractively in heat-retaining cast iron serveware. Salads include a spare but delicious Nicoise with olive oil-poached tuna. A white peach Bellini is a cocktail option, and sometimes a blissful poached pear sundae with vanilla ice cream, chocolate sauce, and toasted almonds is a dessert selection. The kitchen seems to hit the perfect note on everything, so order fearlessly. Chow 215 Church St./Market St., Castro District, 4 blks. 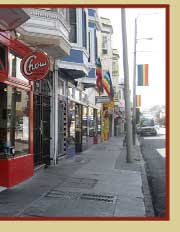 from Castro St., (415) 552-2469. B-L-D daily, Sat-SunBr; $. No reservations. Italian and American selections dominate the menu in this comfortable spot. Best bets include spaghetti and meatballs, hamburgers made with meat from grass-fed cows, pizza, grilled chicken, and tender short ribs with garlic mashed potatoes. For dessert, it’s warm gingerbread with pumpkin ice cream, housemade pie (butterscotch-banana and pecan are primo), and fruit crisp. Brannan’s Grill 1374 Lincoln St./Washington St., (707) 942-2233. L-D daily; $$-$$$. Reservations advised. It is a delight sitting here in one of the oversize booths in the large, open interior dining room outfitted with high rafters and a cozy fireplace for cool weather. The sidewalk-view booths, which have windows that change to screens in warm weather, are also choice. The hearty meat-and-potatoes menu is includes braised short ribs—you can’t go wrong with these--but fish, pasta, and sandwiches are also options. For a perfect ending, consider a flight of dessert wines, but keep in mind that the kitchen is famous for its chocolate lava cake. Bijou Restaurant & Bar 1036 B St./near Main St., downtown, (510) 888-1092. L-D daily; $$. Reservations advised. “Bijou” means “a little gem” in French. And this sleek, chic venue is an unexpected gem of a find in suburban Hayward. 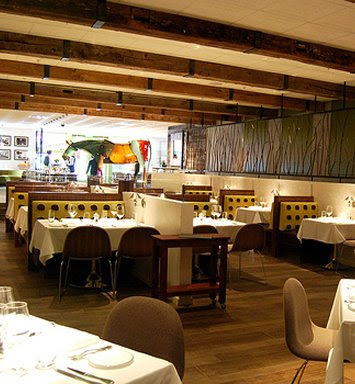 It showcases reasonably priced contemporary French/California cuisine. Lunch offers sandwiches, including a French hot dog or hamburger on a baguette, a croque monsieur or madame, and sometimes a crab melt. Dinner items might include crab and avocado salad, grilled skirt steak in peppercorn sauce, and oven-roasted sea bass in mushroom sauce. Smaller appetites might be satisfied with a small plate of sliders or sautéed prawns. Desserts are elegant, perhaps crème brulée with a hint of green tea, crêpes Suzette, or a selection of macaroons. A full bar offers specialty cocktails and an international wine list, and a sidewalk patio is available in good weather. Be aware that on Sundays this area closes up tight, except for the Century at Hayward movie complex ((800) FANDANGO) that is just across the street. Boogaloos 3296 22nd St./Valencia St., Mission District, (415) 824-3211. B-L daily; $. No reservations. Comfy booths line the walls of this large open room. 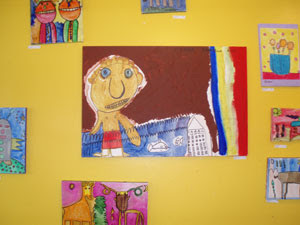 Mosaics provide accents, and artwork made by individuals with disabilities cheer up the walls. After the usual wait, service is quick. Scramblers are made to order from a list of ingredients, and several variations of Eggs Benedict are options. Lemon-cornmeal pancakes, a spicy Mexican-style breakfast, and even The Basic (two eggs and homefries) are also on the menu. Breakfast is served all day, but at lunch sandwiches, soups, and salads join the menu. The housemade savory biscuits are the best, and many vegetarian choices are provided. Bennett Lane Winery 3340 Hwy. 128, (877) 629-6272. Tasting daily 10-5:30. Hidden away at the end of a long vineyard-lined drive, this newish winery operates within a Mediterranean-style building. “Our red wines are soft, with great depth of color,” promises winemaker Rob Hunter. Bennett is the world’s only winery that owns and sponsors a NASCAR racing team. A “petting vineyard” out front permits getting up close and personal with various grape varietals, and inviting picnic tables await on a large grassy area with vineyard views. Get together a group of six or more friends and you can sign up for a unique blend-your-own wine seminar that permits blending and corking a bottle of wine that you get to take home with you ($175/person).